Daylilies are colorful, easy to grow and will shine in many flower garden conditions. Their botanical name, Hemerocallis, means “beauty for a day” (from Greek) because each individual flower lasts only a day, thus daylily. So why grow a plant with flowers that last only a day? Well, for one thing, an established daylily grows many scapes (flower stems) that produce a profusion of buds that keep the plants in bloom for weeks. There has been a revolution in daylily breeding over the past few years, resulting in new colors and forms. The plants are stronger with lots more flowers over a longer period of bloom. There are more than 60,000 registered cultivars. Gardeners love them for their rainbow of colors (they flower in every shade except blue) and many shapes and sizes. They make versatile garden plants too: you can have Hemerocallis in bloom from late spring until autumn. 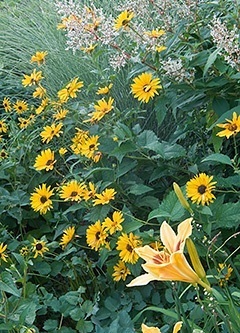 A well-established clump produces many buds and new flowers daily for a month or more. The plants are clump forming, herbaceous perennials with fibrous or somewhat tuberous roots. Grow them in well-drained soil, amended with manure or compost. For best performance give them full sun, at least six hours of sun a day. If you plant them in too much shade, you’ll get more leafy growth with fewer flowers. Besides serving as specimen plants, these perennials excel at providing splashes of color in shrub borders and perennial flowerbeds. They also make excellent ground covers on slopes, where they can provide erosion control. They look particularly nice planted against fences, decks or patios, steps and even driveways. To allow them room to thrive, don’t plant them too close to the roots of broad-leafed or evergreen trees. The plants can range in height from eight inches to five feet, and flower size can be as small as two inches or as large as eight inches. They often bloom the year they are planted, even from a relatively small size, but they will grow rapidly to form dense clumps and they tend to be long-lived. The scape is a leafless stalk, which bears the flowers. Most have two or more branches, each producing several flower buds. A reblooming daylily will have an extended flowering period or more than one bloom season – some bloom early (May or June) and repeat in the fall – others have a succession of bloom periods, one shortly after another for several months. Deadheading or removing the scape (or stalk) will encourage rebloom. Learn more: Daylily planting and care tips.